I love lists so here’s my first one for this blog. This is a list of five perfumes that I think are a perfect match for the Christmas season. These recommendations are for the Northern Hemisphere or anywhere else where the weather is quite frankly not the best. 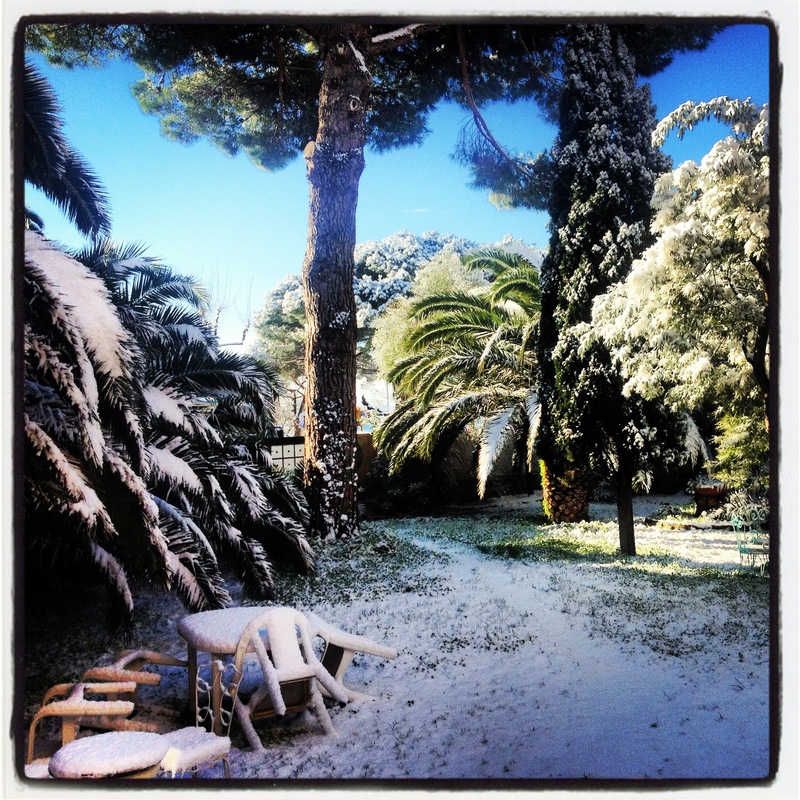 We don’t often see snow in Sainte Maxime although it made its presence known for just over a day, the first December I spent here. This is the slightly bizarre image of snow covering the palm trees in the garden. I’ve selected five from Serge Lutens as this is one of my favourite and first discovered niche perfume houses. It offers a great range of scents that will hopefully be able to satisfy your Christmas fragrance desires. Serge Lutens is undoubtedly a creative genius who is not widely known out of the fragrance and fashion worlds, but I believe many would recognise his artistic work for Shiseido in the 1980’s that made this Japanese beauty brand stand out from the crowd and take it to a global audience. He is of course one of the pioneers in the niche perfume world and is often affectionately referred to as Uncle Serge in the blogsphere. His enduring partnership with Christopher Sheldrake, the nose behind the majority of perfumes in the range has delivered a legacy of outstanding creations. Lutens has a few sandalwoods in his collection to choose from but this one is a great match for braving the shops for those last minute gifts. It has a warmth that radiates a delicious cocoa note with a smidgen of rose making this a gorgeous calming choice. I’m sure this will comfortably smooth those frayed nerves. Arabie is fragrantly spicy, fruity and somewhat sweet, yet not sickeningly so. It was created in 2000 and in hindsight is a brave composition that has been imitated no end in the now crowded niche market. Wear this when you need a bit of comfort – perhaps when that credit card has had a bit of a thrashing. A tobacco smoked, honeyed perfume that brings a sophisticated allure. Perfect for relaxing by the fire with a Bordeaux red. Ideally on a well worn leather couch with someone you love. Equally as thrilling on a man or a woman. Note: This was bound to be on the list as it’s the perfume that kick started my obsession and holds a special place as the one that sent me down the rabbit hole. A dark horse in the Lutens canon but in my opinion one of his best. Christopher Sheldrake has a knack for breathing life into the tired and somewhat unfashionable note of lavender. His guidance steers it towards the path less travelled, far away from the touristy lavender pouches that litter the South of France (see also Gris Clair and Encens et Lavande for alternative takes on lavender). Fourreau Noir is a gothic lavender made beautiful with smoke, almond and tonka. This really is a special perfume and provides an element of intrigue on a cold night out. A brilliant companion for swanning around in the vicinity of the Xmas tree. This pine and incense scent with a spoonful of Luten’s signature stewed fruit really seems like the perfect fit for Xmas Day. It will conjure up the outdoors but you can snugly keep the cold at bay while unwrapping presents under the tree (hopefully there are a couple at least). Obviously I would be remiss if La Myrrhe wasn’t mentioned but unfortunately I haven’t tried it yet, so it would be a bit presumptious to include it here. However according to Tania Sanchez (co author of Perfumes The A-Z Guide and The Little Book of Perfumes – The 100 Classics, alongside Luca Turin) it is one of his best works so this has reminded me that I must get hold of a sample. Are there any Serge Lutens perfumes that you think would be a good fit for Xmas? I love your choices, especially Chergui and Fille en Aiguilles. I would add Five O’Clock Gingembre, it’s bright fizzy ginger and sweet dry tea are gorgeous for Xmas. You’ll have to be quick. they have recently stopped it being export. Thank you for your kind words about APJ, we love seeing you there. I’m adding your blog to our role. I hope that’s cool. Reblogged this on Megan In Sainte Maxime. Nice selection! For some reason Serge Noire is the Christmas Lutens for me. Smokey, incensey and that smell of burning paper. Love it. Hi Christos – nice to see you here. I think I need to spend a little more time with Serge Noire. When I tried it a while ago there was something a little odd in it that didn’t agree with me. But perfume tastes change all the time so perhaps it’s time for a revisit! Agreed! I do love Lutens as it was the first niche I discovered. merry Xmas!